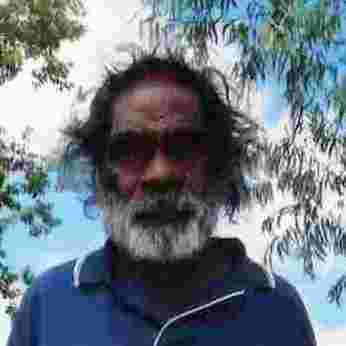 Michael Nelson Tjakamarra (also cited as: Michael Nelson Jagamarra, or Jakamara) is a Senior Warlpiri Tribesman and an Elder of the Papunya Community in central Australia. 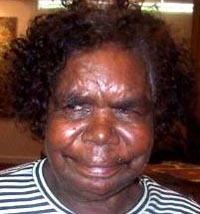 Born c. 1949 at Pikilyi, Vaughan Springs west of Yuendumu in the Northern Territory, he grew up ‘in the bush’. His father was an important tribal elder and medicine man at Yuendumu. It was therefore automatic that he would grow up with the traditional values and knowledge that now influences his paintings. 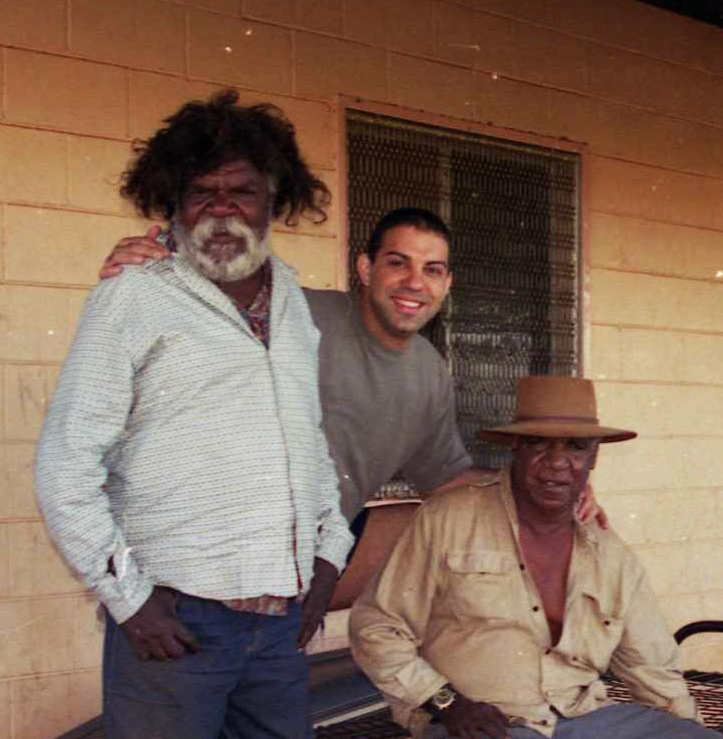 Michael learned to paint at Papunya by observing the senior men such as Billy Stockman and Old Mick Tjakamarra. 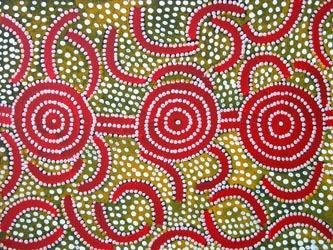 Although he was tutored by his uncle, Jack Tjupurrula, Michael developed his own style and began painting earnestly from 1983. 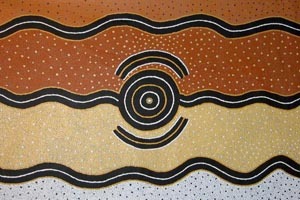 At almost any landmark occasion in Aboriginal art during the golden years of the mid to late 80s, Michael was to be found, patiently giving the same eloquent, heartfelt answers to the media’s questions about why he painted this or that picture and what the Dreaming is. Michael has been painting for Mem Aziz since 1995. 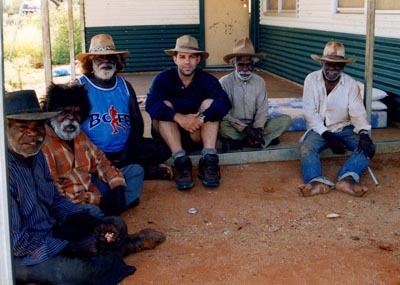 Mem had spent time traveling up north learning about the history and culture of the Aborigines in the 1990s. It was during this active discovery that Mem found how much he appreciated the continent’s indigenous culture. 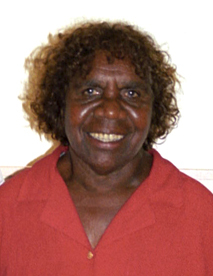 His association with the communities culminated in his being adopted by the tribe and given the Aboriginal name Tjampitjinpa – something of which he is immensely proud. It was during this time that Mem met Michael and they have enjoyed a supportive friendship since those early days. 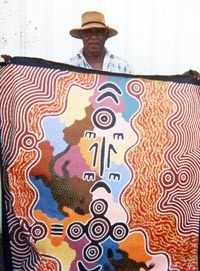 Since 2000 Michael uses bold designs executed in a free flowing way still keeping to the Warlpiri mythology. He is considered to be one of the most famous and prolific painters in Australia and his biography, ‘Michael Jagamara Nelson by Vivien Johnson was published in 1997. Embassy of Australia, Washington, U.S.A.
Corbally Stourton P, Songlines and Dreamings, Lund Humphries Publishers, London, UK, 1996. 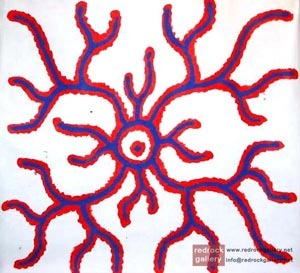 Aboriginal Art Galleries of Australia, Jinta Desert Art Gallery and Aboriginal Desert Art Gallery in association with Fresco Australia, Indigenous Art of the Dreamtime 2 August – 2 September 1999. Johnson, V., Aboriginal Artists of the Western Desert, A Biographical Dictionary, Craftsman House, Roseville, N.S.W. 1994. Kreczmanski, J.B & Birnberg, M., Aboriginal Artists Dictionary of Biographies, J B Publishing Australia, South Australia, 2004. 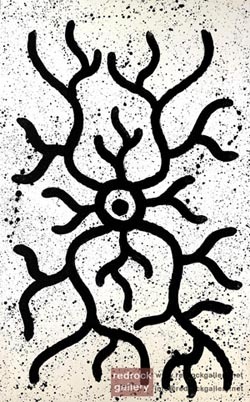 Nangara:The Australian Aboriginal Art Exhibition from the Ebes Collection, Vol.1 – The Text, Aboriginal Gallery of Dreamings, Melbourne 1996. Perkins, H and Fink H,[eds,] Papunya Tula, Genesis and Genius, Art Gallery of New South Wales, New South Wales, 2000.